A video photo booth rental allows people at your event to video record a short message using a photo booth which is running in video recording mode. This is ideal for a wedding or special event where the guests may want to share a few words, offer some advice, share a funny or meaningful memory, or offer some encouragement to the bride and groom or the event’s honoured guest. Weddings -Guests, family, and friends can record a message for the bride and groom. Anniversaries – Family and friends can share how special the couple is to them and how much their lives mean to everyone. Milestone Birthdays – Friends can take a moment to say something to the birthday boy or girl and possibly even share a great memory they enjoyed together. Appreciation Events, Fundraisers, and Awareness Events – Capture people at the event sharing on video what they person or cause means to them and how they or the cause have made a difference in their life. The cost to rent – or for all you English folks, hire – our video booth starts at $549 for a 2 hour rental. You can rent the booth for almost any length of time. Contact us for prices for longer rentals. Our video photo booth always comes with an attendant who will take care of the booth and assist your guests if they need any help recording their videos. The booth can also be switched over to photo booth mode too. So it’s possible for it to operate as both a photo booth and a video booth during the same event – a perfect way to get the most out of a wedding. We can also bring along props if you’d like to make them available to your guests for their videos. We also take care of setting up the booth and taking it down too. We take care of everything for you so you can just relax and enjoy your special event. So if you’re looking for a video photo booth rental for a wedding or special event in Vancouver or the Lower Mainland, give us a call and we can discuss what you have in mind. 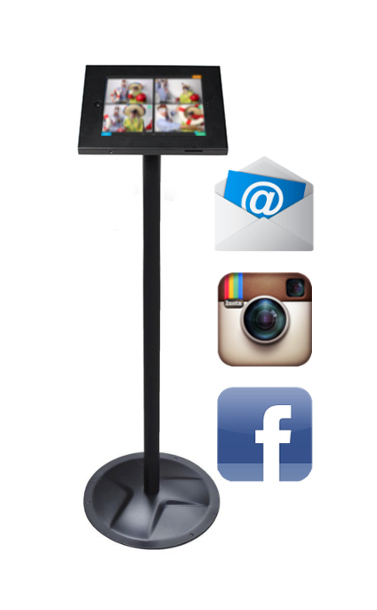 Every one of our photo booth rentals includes our Social Sharing Kiosk. This touch screen doubles your guests' fun by allowing them to share their photo booth pictures with friends on Facebook, Instagram, or by email. "Forever captured helped make our wedding a complete success! Top notch service. Their staff took the time to understand our unique needs. I would highly recommend using Forever Captured! Thank you so much!" "The photobooth was a HUGE hit with my guests and the service Johnny provided was outstanding! I am taking time out of my honeymoon in Spain to write this review because I was so impressed and didn't want to forget! Thanks so much Johnny! I hope to see you at another event soon!" "Love the energy they bring to the table and the professionalism during the meeting and at the event. Josh was a genius at coming up with the design for the frame. Johnny's set up was superb, didn't disturb the event and makes the night smooth and full of laughter. Had a BLAST at my own wedding because of these guys. Photo booth was well received by the guests. Will definitely recommend to friends and family." "Our company had a great time with this photobooth, what a great idea!!!!! Tons of props to choose from and the service was fantastic. We will definitely be booking them again."